SAN FRANCISCO, July 19, 2017 – Intersolar and ees North America 2017, the solar and energy storage industries’ premier events dedicated to the North American market, concluded its 10th annual event in San Francisco last week. “We’re continuously impressed with the high-quality attendees we meet while exhibiting at Intersolar North America each year,” said Denise Hugo, director of marketing at Array Technologies. “The solar tracker industry is a growth sector within the expanding solar landscape, we’re glad to be able to connect with our fellow leaders in San Francisco each July. "For Pick My Solar, Intersolar North America provides an unparalleled opportunity to meet with leaders in every sector of our industry in a great venue,” added Kyle Cherrick, head of business development at Pick My Solar. “That's why so many big deals get done during Intersolar; it acts as a marketplace that features key players and fosters connections across the entire industry. We love the event and are already looking forward to next year." "Intersolar North America 2017 proved to be a tremendous trade show for Solaria — providing a great forum for reaching our customers, partners and prospects in an energetic atmosphere," said Solaria CEO Suvi Sharma, which showcased its new highly efficient module. " There's keen interest in our new product, and being able to display it for the many solar professionals attending Intersolar provided us with phenomenal return on investment." During the Intersolar/ees North America exhibitions, companies ranging from established industry leaders to promising startups have displayed the technologies that promise to continue to reduce the cost of solar and storage solutions. Once again, the Powerhouse Pavilion, hosted by Powerhouse, the world’s only incubator and accelerator dedicated to solar that collects the most ingenious intelligent energy startups and entrepreneurial ventures, was in the spotlight. This year, 12 companies participated in the Pavilion, including UtilityAPI. Elena Lucas, co-founder and board director at UtilityAPI, also spoke alongside leading renewable energy leaders and policymakers during the Opening Ceremony’s keynote session, where she provided an entrepreneur’s perspective on the industry. During her remarks, she stressed the importance of networking events and seizing opportunities only Intersolar/ees North America can present. Intersolar and ees North America organizers are dedicated to offering innovative events and networking opportunities year after year. The 2017 events were no exception, connecting exhibitors and leading industry organizations in unique special events. In particular, the WRISE and Shine! networking breakfast, organized by theWomen of Renewable Industries and Sustainable Energy (WRISE), was a well-received and bustling event advocating gender equality in the solar and energy storage industries. 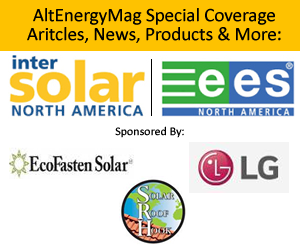 Both Intersolar and ees North America are known for covering the latest technological and political developments affecting the solar and energy storage industries. This year was no exception with the Section 201 trade petition hovering as the “elephant in the room.” This was a leading topic among conversations and conference sessions, with a lively debate surrounding expected outcomes and impacts of the decision, especially during the four-part Intersolar Finance Symposium, new to this year’s event. More than 220 speakers participated Intersolar/ees North America conference sessions, which covered a variety of topics ranging from energy storage technologies, applications and project case studies; PV plant design and monitoring; smart renewable energy; and financing solutions for solar and energy storage projects. The 2018 Intersolar and ees North America exhibitions and conferences will take place in San Francisco on July 9-12, 2018. Exhibitors interested in having a footprint at next year’s events can contact Jim Callihan at callihan@intersolar.us.